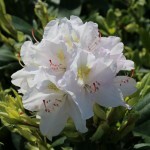 Vigorous, open growing, with upswept branches. The very pale lilac buds open to clean, bright white with a greenish yellow throat. It has large, dark green leaves. H-1. It prefers partial shade to full sun, and moist, cool, acidic well-drained organic soil. Removal of spent blossoms encourages new growth and future flowers.